On October 8, 2002 I was induced because of toxemia. I was 37.5 weeks pregnant. Earlier that day, I had an appointment with a specialist in high-risk pregnancies because my doctors had been concerned about low amniotic fluid and the possibility of IUGR. The doctor performed an ultrasound (I had 10 ultrasounds total during my pregnancy). He found that the baby did not have IUGR and that my amniotic fluid level was fine. He told me the baby is perfect. However, because of my unusually high blood pressure, the doctors felt it best to go ahead and induce labor that day. About 5:00 PM, the doctor inserted a balloon and some cervical gel (because I had not begun to dilate). Several hours later, I looked down and the sheets were covered in blood (there was a circular area about 12 inches in diameter of blood). My husband called the nurse, who changed the sheets and cleaned me up. She said some bleeding was normal. Later that night, I felt a gush of fluid and thought my water broke. I asked my husband to call for the nurse. Instead of my water breaking, we found it was a large amount of blood. Two doctors came in and examined me. They thought my placenta was abrupting. So, we elected to do an emergency c-section. The babys heartbeat was still strong. At 11:37 PM, my son was born. I saw the look of horror on my doctors face as he lifted my son out of my body. The doctors later told me that my son, Hunter, was the color of cigarette ashes. He was not breathing. His Apgar score at 1 minute was 3. Fortunately, his heartbeat was strong. I watched helplessly as the medical team tried to revive my son. They told us that Hunter had lost over 75% of his blood. It was going to be hour by hour. Each day, they told us that Hunter was fighting for his life, and may not survive the day. The social worker at the hospital suggested we have a priest bless the child. That first night, October 9, we had our pastor baptize the baby. During the first 24 hours, Hunter had a massive seizure. Hunter did not start breathing on his own for about 10 days. He had three blood transfusions, surgery to insert a chest tube, and was fed through a tube in his umbilical cord stump. Slowly, his organs began to work; he began breathing on his own, and began feeding normally. After 18 days in the NICU, Hunter was able to come home. 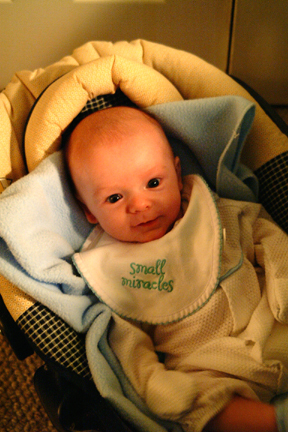 So far, he is a healthy, happy three-month-old. We have tested his vision and hearing, both of which were a concern for the doctors because Hunter spent so much time on a respirator. Both tests came back fine. The pediatric neurologist is very pleased with Hunters progress. We will continue to monitor his development, but are hopeful that he will progress normally. He has had no seizures since that first night and no longer requires anti-seizure medication. The pathology report came back a week after I gave birth. It showed velamentous cord insertion. Apparently, when labor was induced, Hunters umbilical cord tore and he lost his oxygen supply and most of his blood. We consider ourselves very blessed that my labor was induced and that we were at a hospital with a top-rated NICU. The doctors and nurses were amazing. We know that Hunter would not be alive today if I had gone into labor anywhere other than the hospital. He truly is a miracle.